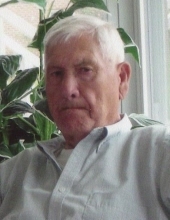 Alton Thomas Ball, 89, passed away on Wednesday, April 3, 2019, at the home of his grandson in Jacksonville. Alton was born in Duplin County on July 19, 1929, to the late Adolph Atlas Ball and Daisy Hansley Ball. He was married for 51 years to the late JoAnn Best Ball. Alton retired from the maintenance department of Goldsboro City Schools after 33 years of service. He attended May’s Chapel Free Will Baptist Church. Alton proudly served as a Sergeant in the United States Marine Corps during World War II and the Korean War. Alton had a love for fishing, Carolina Tar heel Basketball, working in his yard, chewing tobacco, church, breakfast at McDonalds and most of all spending time with his family. He was a true hero to our country and most of all to his family. As tough a man as ever walked this earth, he was full of pride and humor to his last breathe. A graveside service will be held at 4:00 p.m. on Saturday, April 6, 2019 at Maplewood Cemetery in Mount Olive with honors being rendered by the U.S. Marine Corps. The family will greet friends Saturday immediately following the service at the cemetery. Alton is survived by his son, Michael Thomas Ball; grandson, Elijah Alton Ball and wife Jackie; and great-grandchildren, Zachary, Isaiah and Axl Ball, and Alex and Kloie Jordan. In addition to his wife and parents, he was preceded in death by his sister, Bernice Wellington and brothers, Kenneth J. Ball and Bobby Ball. In lieu of flowers, the family suggests memorials be given to Kitty Askins Hospice Center, 107 Handley Park Court, Goldsboro, NC 27534. To send flowers or a remembrance gift to the family of Alton Thomas Ball, please visit our Tribute Store. "Email Address" would like to share the life celebration of Alton Thomas Ball. Click on the "link" to go to share a favorite memory or leave a condolence message for the family.